In this 3rd dimensional reality, we are truly at the dawn of some new era. But what will define this era? Seems there are so many questions soon to be answered. Those answers are the future. The future is upon us for we are in the final minute of the past. Many are awakening to the light of truth. Many still sleep in the slumber of ignorance. All the while, a fractional group of global elitists plot to dominate and control you all. How far will they push you? How far will you let them push you? We are about to depart on a new trip. There is a great change coming. No, that is not a prediction, it is a fact. What I know and what you do not is why I am writing and you are reading. There is nothing you can do to stop it. there is nothing you can do to alter its course. It is coming for us all. Do not be afraid. Have no fear, that is crucial. You must let go of all you fear and all you fear to lose. Separation is the illusion. You are all so much more than this and soon you will see whether you are awakened or not. How you handle the gravity of what is coming is what will save you. If you give in to your fear and the negativity that stems from that fear, you will be swept into your prison inside yourself until you learn to become free. Nothing is permanent, anyone can change and evolve at any time. One must simply choose for themselves. Those who are brave, those who stay confident in the power inside of themselves, those who exist from love and to love, you will be ascended to a higher level, a greater state of consciousness. No there will be no ethereal light show and trumpeting angels or any of that sort of thing. Not saying that couldn’t happen, but let’s stay with what feels right. Here’s the breakdown: The insanity of the global mentality reaches an apex in which it must give one way or another. Those who submit to fear are stuck in the vibration of a 3rd dimensional nightmare until they finally snap out of the hypnosis and wake up to their Higher Self. 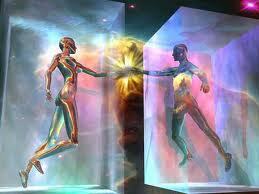 Those who allow the infinite power of love to guide them resonate fast enough to bump back up to the 5th dimension. Sound magical? Well it really isn’t at all, it is compliant with laws of quantum physics and in fact, quite possible as well as probable. You are all in the 3rd dimension now, vibrating as slow as consciousness can to exist, accelerating faster and faster through the 4th dimension of time. The state of this ever-more-chaotic world is a direct reflection of that acceleration. Everyone is now either getting exponentially smarter or dumber depending on how attune they are to the increasing frequency. The Schumann resonance rising, the global human frequency rising, every day, faster and faster and faster. It can only increase so much before the levy breaks. That break is imminent. Can you not feel it? Close your eyes, feel the tension of it all, the suspense is terribly beautiful. Any moment at any time, the pressure will overwhelm the confines of stability. It will happen so fast, day to night in an instant. How can anyone prepare for such a thing? How can anyone prepare for an explosive simultaneous evolution/devolution event on a planetary scale? You can only be ready by letting go of your ego and becoming One again with your soul consciousness. Not very difficult, but where are all of you who are aware and are acting accordingly? What about all these events going on now? Gun control, people control, war, chemical spraying,water fluoridation, gmo food, mass hypnosis via your television, just to name a few. The agenda here in this 3rd dimensional reality is to control the masses. You are part of it whether you like it or not, but you no longer have to be enslaved to it. While these elitist pigs try to dominate the world, you can be focusing on your Higher Self and the real trip that you are on; your infinite cosmic journey as a being of energy and light. So there is total collapse of society into some Orwellian monster. They want it all to be a compliant, controlled police state. They also manipulate the weather on a daily basis in case you have been living in a cave for the last few years and haven’t been privy to the bizarre climate changes occurring all over the globe. They have control over oil, they have control over money, they have control over the medication, all to control the people, and they now try to control the environment, but all of this control is about to come back and slap them all across their globalist pig illuminati scum faces. This insatiable need they have for total dominance is obscene. Such a waste of human energy, but I am not so certain they are human. Very debatable. But you must be above and beyond that. Remember what i told you, it’s all about how you resonate. You are only here for a short time anyway. Let go of your fear, let go of your connections to these menial melodramas. You are so much greater than this slow-vibration mentality. They are all stuck in their egos and the dualistic conflict inside those egos. They manifest it upon all of you, but you do not have to be part of their trip. Let go. Trust in yourselves and let go. Free your soul and just let go. So before the great change comes, before you, we, all get to free ourselves from the tyranny of this 3rd dimensional reality. Strange how even the reality itself has become a tyranny of sorts isn’t it? But I digress. Before this mass metamorphosis comes for us all, focus on being as knowledged about truth as you can be. The real truth, not the spoon-fed fake truth from the MSM. Focus on the energy of the love inside your heart and how you radiate that love inside yourselves and out to others. If there are people that dislike you and/or hate on you, let them go. You deserve to be surrounded by the same positivity you try to show toward others. If some people cannot get on the same page, let them go. They will awaken and open their eyes to see the light in their own time. You may seem inclined to help anyone and everyone at all personal expense, but that duty is not your responsibility, so just let it go. Focus on what you truly are, what we, truly are. We are solar beings of energy and light. We are infinite and boundless, our souls have and will always be free. The only things that can enslave you is yourselves. This trip in this 3rd dimensional paradigm is about to get even more bizarre and irrational. The vibrational frequency is still rising remember? More and more people are going to appear to be going and acting insane and illogical. More and more will become awakened and give hope to others. But the division and separation is already there, it is unstoppable but perhaps necessary. Sadly, not everyone will get it. So there will be this tremendous shift in world consciousness. Once the bubble bursts, the story of us ends and begins anew. Nothing will be the same, ever. Look around, it can happen at any time now. Everything you see around you will be altered forever. But please, please DO NOT BE AFRAID. This change is inevitable. It is for a greater good and as long as you are right with your Higher Self, you have only the endless possibilities of the 5th dimension awaiting you. There is only this final time of getting through this last step of this experience we are all sharing in this 3rd dimensional world. When the frequency changes to the next note up, you will see. Aren’t we all so lucky to be a part of this evolution of consciousness? We are, we are all very lucky indeed, at least those of us who understand. Those that don’t and/or can’t, we wish you the best. Your plan is not in my hands, but I wish all you who stay asleep to have sweet dreams. The rest of us, those who are awakened and who are awakening, be ready. You may think you are fearless, but stay aware. Fear is sneaky and just like your ego, can slip back in at the crucial moment to undermine you. We are all going to be tested. The events soon to unfold are going to test us all. Many will just roll over and submit to their masters in cowardice. Is that who and what you are? A coward? Hell no we aren’t cowards by any means. We are fearless divine beings of higher consciousness and it’s our time to rise and shine brighter than we ever have. So bright that we blind the eyes of these fascist pigs who seek only to control and dominate others. They want to destroy this existence because of their greed and their insanity, they can go ahead and try. Their negative agenda will always fail because the universe is inclined to balance itself out. They put forth this demonic plan to choke the life out of humanity and enslave the hearts and minds of the people, humanity returns the favor by choking them out for good and freeing the hearts and minds of those people who seek only to better existence. Do not worry about what they try to tell you all via the MSM. The MSM only perpetrates the lies of the globalist agenda. Detach from that, let go. if you fear them, you give them your power. They are nothing without you, they are parasites, feeding off of your blood. Be above them, level yourselves up so you can always have the high ground. The vantage point of the high ground will be very important in the days to come. We must always maintain the higher ground. If we sink to their level, they gain power. You all have the power. We are all so much stronger than they are. This time here is brief, only a test. A test between giving in to fear, or becoming infinitely courageous through love. No one escapes, everyone is taking the test. Will you pass or fail? Will we, pass or fail? The choice is yours, ours. I know what i choose. I am free, have always been, will always be. If it takes my untimely death from this mortal coil to insure that I remain free, so be it. I welcome Death, I have no fear and I trust completely in the Infinite Love inside me to guide me back to the dimension from whence I fell so very long ago. And if I am crazy, I still die free and happy, secure in the fact that at least I truly lived while I was here and died for what I believe in. Can you say the same? When their army marches in and offers to buy your soul, what will you do? Will you conform and obey, consumed in your own fear or will you stand up for yourself and refuse to be enslaved? That choice is going to have to be made by you all, like it or not. Before you are free to ascend, or you are well past the events soon to unfold, you will have to decide how important your personal freedom really is. Will you sacrifice your life to be free? For me and many others it is not a question. Why live without freedom? Think about it. Get yourselves ready. The time of no more time grows closer faster and faster. Before that time gets here, we are all in for some unprecedented twists and turns on a ride we’ve never ridden. This train has no conductor and has flown way off the tracks, but it still has the momentum to keep plowing forward. Where this train finally stops and let’s us all off is yet to be known. All you can do right now is hang on tight and make sure you stay conscious of yourselves and your well-being. Everything is about to change, but you mustn’t give in to fear. Let go of what you fear, become One with your soul and the Infinite Love that feeds your soul, and trust that the energy inside you will guide you through safely to the other side. Stay informed and stay awake. Love to all.